1. The Trump economy: President Trump's first economic report card showed the U.S. economy grew at annual pace of 0.7% in first quarter. That's the slowest rate since 2014. Trump was president for most of the first quarter, but many of his ideas for speeding up the U.S. economy have not yet become law. During the presidential campaign, Trump pledged to create 4% growth, something not seen since the late 1990s. 2. Across the pond: U.K. GDP growth slowed to 0.3% in the first quarter, down from 0.7% in the final three months of 2016. The country's economy had shown signs of resilience after the Brexit referendum in June. But higher inflation is now starting to bite into consumer spending. The leaders of the 27 other EU members will meet on Saturday to set the bloc's strategy ahead of divorce negotiations. 3. 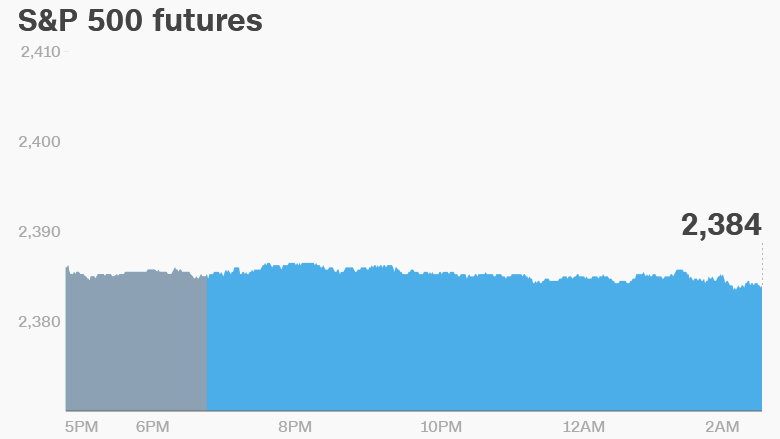 Global market overview: U.S. stock futures were flat early Friday. European markets were mostly lower, while Asian markets ended the session mixed. The Dow Jones industrial average closed flat on Thursday. The S&P 500 was up 0.1% and the Nasdaq closed 0.4% higher. Oil prices climbed more than 1.4% overnight to $49.55 per barrel. 4. Stock market movers -- Alphabet, Amazon, Starbucks: Shares in Alphabet (GOOGL), the owner of Google, jumped 4% in premarket trading. The company's results, published Thursday, showed its sales reached $24.8 billion in the first quarter. The company also revealed that it had succeed in developing some new sources of revenue. Amazon (AMZN) was also up premarket on a strong earnings report. The stock is now approaching the $1,000 price mark. Western Digital (WDC) surged in extended trading after topping analysts expectations in its earnings report Thursday. Starbucks (SBUX) was down premarket after reporting weak sales growth in the U.S. Intel (INTC) was also heading for a lower open after the company missed sales forecasts. Shares in Barclays (BCS), one of Britain's biggest banks, plummeted nearly 5% on Friday after reporting its results. Bank CEO Jes Staley is in hot water after admitting that he tried to unmask a whistleblower. 5. Earnings and economics: Exxon Mobil (XOM) and Chevron (CVX) are reporting results before the bell. Both are expected to show strong profits, benefiting from their cost cutting programs. Colgate-Palmolive (CL), General Motors (GM), Honda (HMC) and Spirit Airlines (SAVE) are also set to release earnings before the open Friday. France reported 0.3% GDP growth in the first quarter on Friday. Spanish GDP growth jumped to 0.8% in the first quarter, suggesting that eurozone economic growth accelerated at the start of 2017. Eurozone inflation increased to 1.9% in April.